Let me introduce you to the smoothest, most crisp cocktail you can get yours hands on this season. With muddled figs and light ginger beer, it is all the flavor you want, without ordering a flavored latte at happy hour. 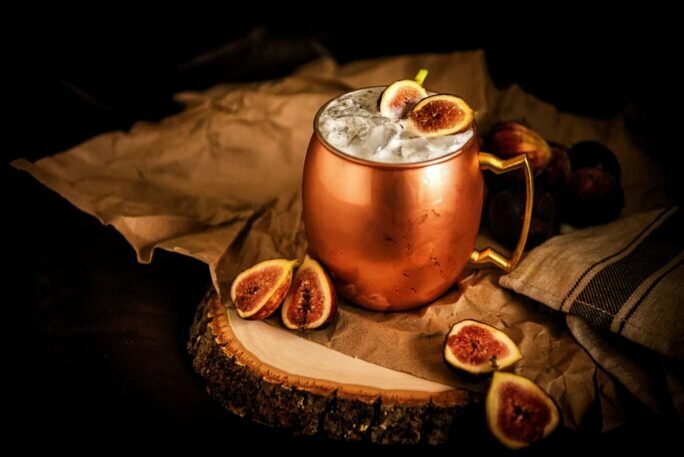 Introducing the Muddled Fig Moscow Mule. My daddy always had a box of those fig filled cookies when we would take our annual vacation to the beach. The car would be loaded down with us kids, as our grandparents drove us to the beach. I can remember reaching into the cooler and sneaking those little cookies on our long summer days. If we did go out for supper, it was a family meal at Grotto’s. Otherwise, we packed it, and we never knew any different. Last year while camping with friends in Utah, I bit into my first fresh fig. It was soft and mushy on the inside, a texture that has always bothered me. There were always sandwiches, cookies, and occasionally Twizzlers as my cousins and I would dart back and forth from the ocean waves. Now, whenever I see fig filled cookies, I think of my father. It wasn’t until last year, camping in Zion National Park with some friends that I bit into my first fresh fig. It was soft and squishy, a texture that I have never enjoyed, but the flavor was perfect. It tasted just like those cookies, just sweet enough without being too sugary. I was instantly hooked. I even went out and purchased my own fig tree, only to have it wither and die in moments in the full sun of my humid Delaware summer. Lucky for me, I was able to talk a local produce department into stocking a healthy supply of the delicate little fruits, and I have made sure to reap the bounty. When can you have fresh Figs for a Muddled Fig Moscow Mule? Domestic figs are mostly grown in California and are in season from August through October. Though they have a shorter season in early summer as well, they aren’t spotted on shelves across the country until their second, more extended season. Figs are soft and must be handled gently when harvested. Once plucked, they do not continue to ripen and last in refrigerator 2-3 days. Once collected, figs are packed in large containers to minimize bruising and shipped across the country. Their delicate nature results in a short season for the continental United States. However, they are readily available dried all year long, packed and waiting to be used. 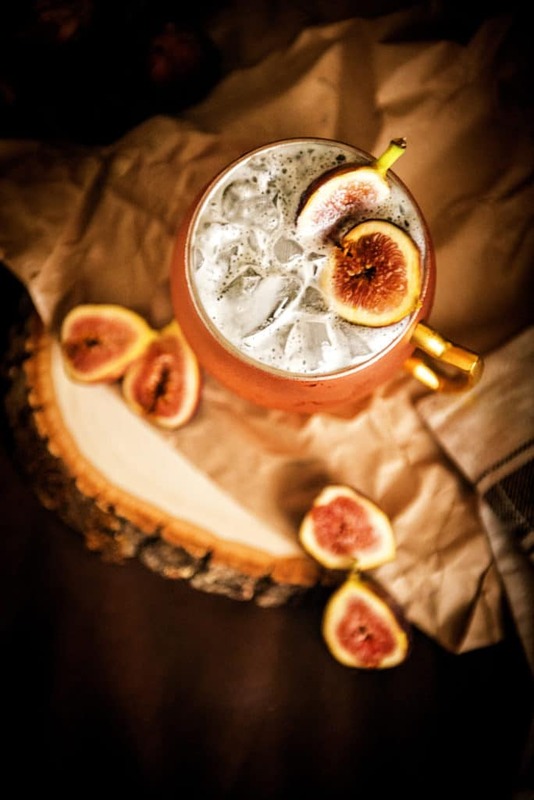 For this seasonal spin on a happy hour classic, I paired a fig vodka, fresh muddled figs, and a light crisp beer for a smooth after work libation. 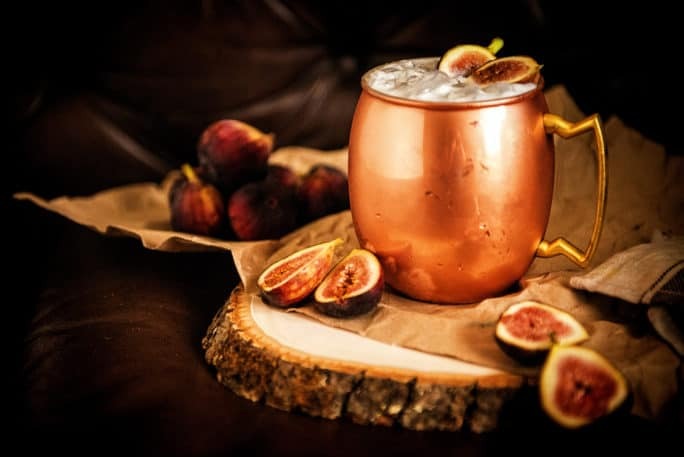 The Muddled Fig Moscow Mule is one I am going to keep in my back pocket for future cocktail parties as I know it will be a hit. Fig season is disappointingly short. If you missed out on the figs this year, but still crave something gingery for happy hour, I’ve got you covered. 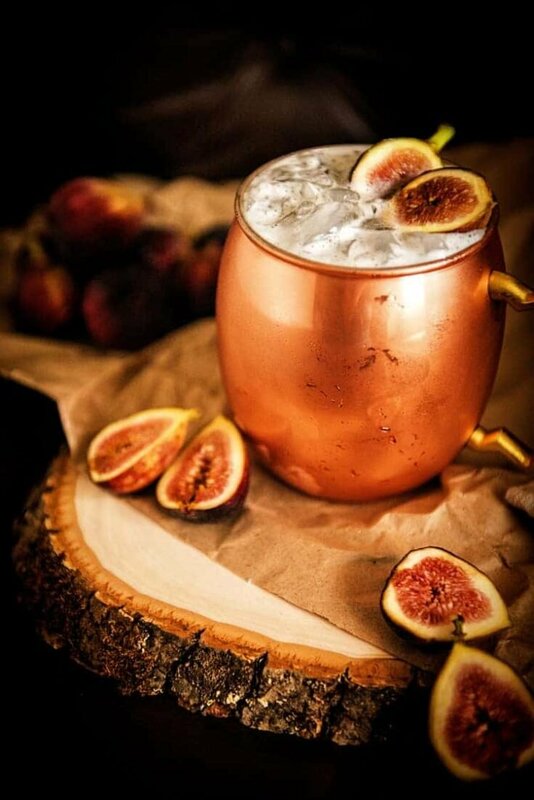 If you’ve tried my Muddled Fig Moscow Mule recipe or any other recipe on passthesushi.com please don’t forget to rate the recipe and let me know where you found it in the comments below, I love hearing from you! You can also follow along for more good eats and travel tips on Instagram @passthesushi & @girlcarnivore, Twitter & Facebook. With muddled figs and light ginger beer, it is all the flavor you want, without ordering a flavored latte at happy hour. 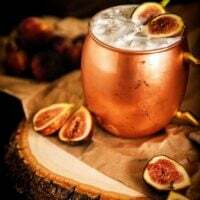 Introducing the Muddled Fig Moscow Mule. Muddle the figs in a cocktail shaker or directly in the glass for the mule. If muddling directly in mule glass, add ice. Otherwise, add the vodka to the cocktail shaker and pour over ice into each glass. Top off each mule to the brim with ginger beer. Garnish with fresh sliced figs.